That's right, there's a new brooch in town. 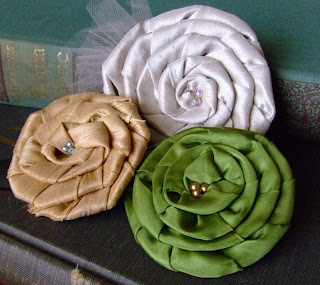 Say goodbye to the old ones and make way for the new brooch of brooches. Forget the flowers (well, no don't, I still love the flowers) it's all about the rosettes. I went on a rosette-making-rampage a few weeks ago, and I must confess, I'm quite smitten. I have quite a bit of satin, but it's too small to use for anything else, so I've fashioned it into rosettes full of vintage and whimsical charm. front page, and I caught it! 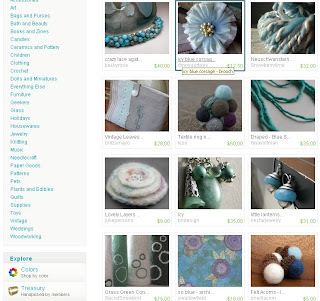 Oh what joy and what surprise (when I open up my eyes and see a hippo hero standing there...I have that song stuck in my head) when I go to Etsy this morning and see one of my satin flower brooches on the front page!!! I've been on the front page from treasuries two other times, but they've both been around 1-2am, so I didn't get to see. One other time I was on the front page because of a Storque article, but treasuries are definitely the best because the pictures are bigger, and they're at the top! So, It was pretty exciting and I thought I'd share! I'm totally in love with parrots so my husband occasionally finds pictures online and emails them to me. I'm not sure where these pictures came from, otherwise I'd give due credit, but they are so adorable, and they look like the wild cherry headed conures in San Francisco (which they might be, I just don't know), so I just had to share. 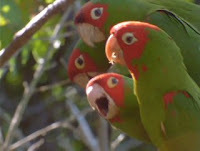 My husband bought me the movie, "The Wild Parrots of Telegraph Hill" last year for Christmas, and although it broke my heart, it also became an instant favorite. Then he bought the book, and while I'll always be a fan of Sophie Kinsella, Plum Sykes and Emily Giffin, the book jumped to the top of my list as well. I thought I'd finally found someone who understood and was as connected to parrots as myself. I won't get on my soapbox and preach of the atrocities that go on in a parrot's life day to day, wild and domesticated, but I will say that if you are a little interested in parrots, or in the animal-human bond, or in anthropomorphizing at all, then you should definitely watch the movie. And then if you have time, read the book as well. And if you feel inclined to email Mark Bittner and let him know how touching the movie is, go ahead, he always responds!